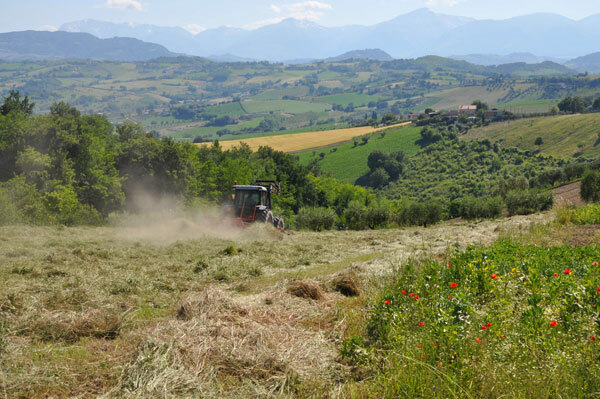 Fontegranne is a family owned Biodynamic farm that is performing gastronomic alchemy in the lush hills of Belmonte Piceno in Le Marche Region of Italy. 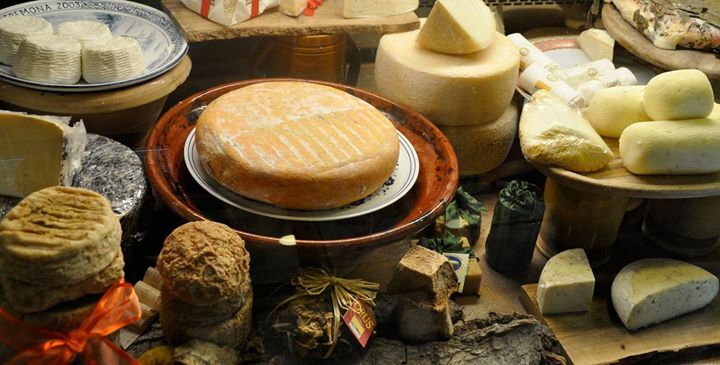 In traditional Italian style, Fontegranne produce delicious farm to fork food that includes an incredible range of raw unpasteurized milk cheeses that are stocked by the best local restaurants. The farm was founded in 1968 when the current owner’s father Alfredo, who was a sharecropper, bought the first 9 ha of land, the farmhouse and barn and a few Marchigiana cattle, the robust, muscular local breed. In 1984 his son Eros joined his dad and by 2000 he had begun to focus on organic agriculture and cheese production and in particular on “lost cheeses” that had disappeared over time and on a number of new recipes. The Fontegranne farm, sits amongst olives and medieval terracotta buildings above the Amphitheatre and the Roman town of Falerone. It has 84 hectares of organically cultivated land, 150 milking animals that include sheep, goats and cows. The milk is sold in part to a cooperative and the rest is transformed into more than 20 types of cheese; which are amongst the most delicious we have ever tried. The intense depth and complexity of flavour in Fontegranne’s cheeses is down to the use of Raw milk or latte crudo. Unpasteurised, it contains micro-organisms that are usually destroyed during sterilisation. Raw milk cheese made under controlled conditions contain great nutrients that promote gut health and ensure an unusual depth of flavour. 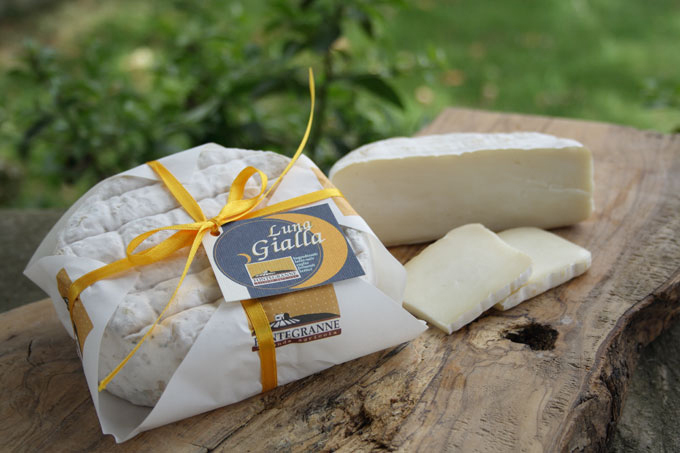 The 20+ raw cheeses are made from their own goats, sheep and cows and a number where 2 or more milk types are combined. They range from the full flavoured corpulent and mellow Luna Rossa, to Earthy mushroomy 3 month cave aged Fossa, through to Caseus a soft cows cheese that tastes of pepper and almonds. Fontegranne is also an Educational Farm with five different courses dedicated to children of all ages. The hands-on approach allows them to discover world of organic farming, to gain a better understanding of sustainability, the environment, the animals and of the farmer’s life. Their “Farm of the swallows project” helps illustrate the symbiotic relationship between species and the importance of a respect of nature. We can arrange a farm tour and tasting visit for tourists and holidaymakers. This includes a variety of delicious cheeses that are paired with their own speciality jams, mustards and jellies. You can also sample cured meats and sausages, their wonderful extra virgin olive oil and a small selection of wines from the best wine cellars of the Marche. 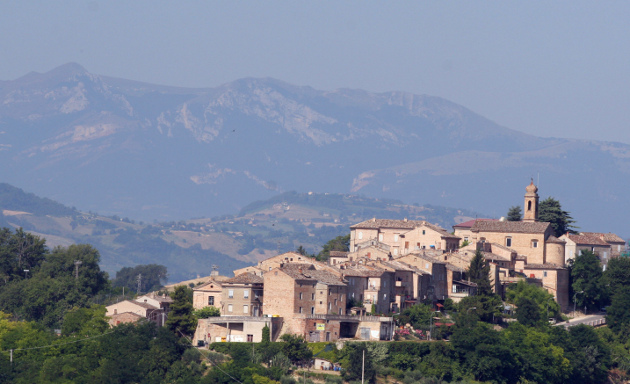 I own a property in San Ginesio and my gang are always looking for exciting things to do whilst we are on holiday in the summer – perhaps some activities, shopping excursions, vineyard/cheese making trips etc. I know you own a property yourself, but I just wondered if you ever got involved in arranging other holiday home owners itineraries? Damien…I tried to add my email to your blog too but I get “unknown” error, please try again. I want to keep up with your place in hopes of a return! Thank you!